Rural community energy projects in the Global South have too frequently been framed within a top-down technologically-driven framework that limits their ability to provide sustainable solutions to energy poverty and improving livelihoods. This framing is linked to how energy interventions are being imagined and constructed by key actors in the sector, via particular sociotechnical imaginaries through which a set of increasingly universalised energy futures for rural communities is prescribed. Projects are too frequently reverse-engineered through the lens of particular combinations of technologies, financial models and delivery mechanisms, rather than by attending to the particular energy needs/aspirations of individual communities. Assumptions over the association between energy access and livelihood enhancement have also reinforced a technocratic determination of appropriate system scale and a search for universalised ‘scaleable’ delivery models. There is, however, no necessary causation between scaleability and outcomes – appropriate implementation scales are not purely determined by technical or financial considerations, rather it is the social scale via which optimum forms of local participation and ownership can be achieved. 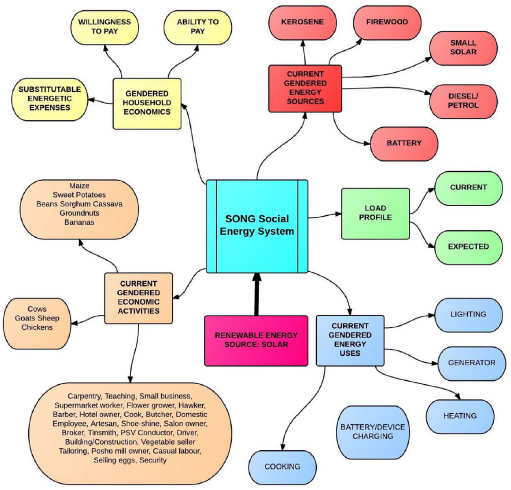 To operationalise this concern for social space we propose a Social Energy Systems (SES) approach that is advanced via exploration of the interactions between three distinct but mutually edifying variants of energy literacy – energy systems literacy, project community literacy and political literacy.